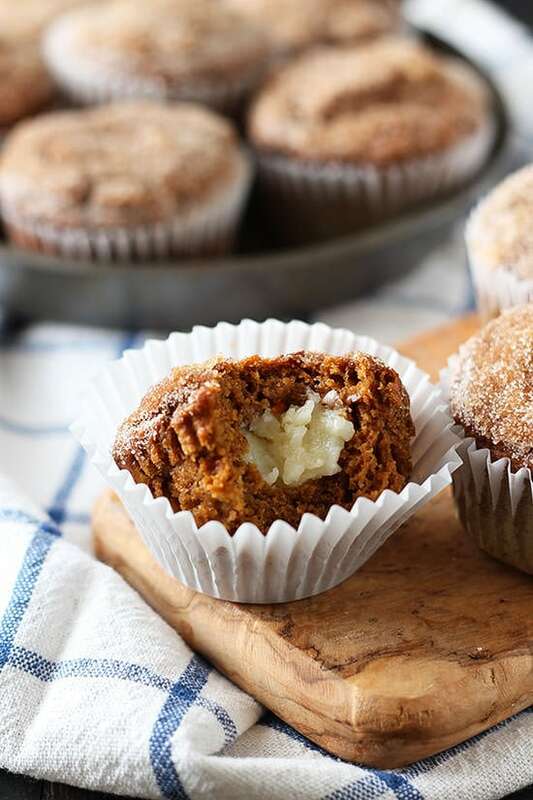 Pumpkin Cheesecake Snickerdoodle Muffins are tender pumpkin muffins stuffed with cheesecake filling and topped with a crunchy coating of cinnamon sugar! No one has to know they’re almost healthy! Taste: These taste like fall, seriously. Perfect amount of sweetness and spice. 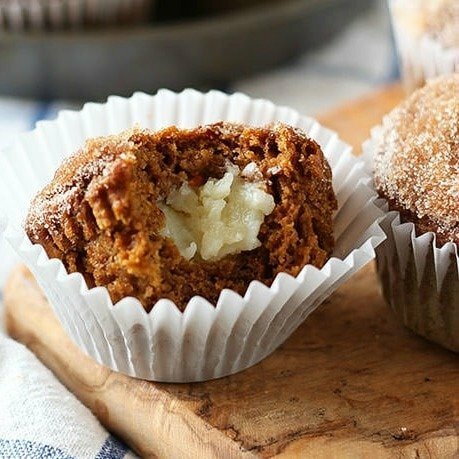 Texture: The muffins are tender, the filling is thick and luscious, and the cinnamon-sugar coating adds a wonderful crunch. Appearance: When these are freshly coated with the cinnamon sugar they look beautifully sparkly and festive. Pros: Easy, delicious, aromatic, and made with whole wheat flour and no butter or oil! Would I make this again? Of course. I am currently sitting at my computer inhaling fumes as I try to finish this blog post. The fumes are coming from the kitchen, where we are having our hideous oak cabinets painted. We’re also adding molding and hardware because the cabinets are seriously the most basic, plain, boring, drab cabinets you can make. Why do homebuilders get away with the most basic of finishes now? Our 1990s house has absolutely zero character. At least it doesn’t have any serious plumbing, electrical, or foundational issues (that we know of) but it looks like every other house on the street. First world problems. The cabinets have starred in most of my food videos and I’m so thrilled to be finally upgrading them slightly. When we bought the house there was already granite in the kitchen and bathrooms, so getting new cabinets wasn’t really possible. The granite is beautiful but sadly it wouldn’t have been my first choice and it’s certainly not worth replacing. Since it’s so warm and tan in color, we decided to go with a darker cabinet stain to match. I guess I’ll have to postpone my dreams of having a beautiful big open white kitchen. Have you ever painted or refinished cabinets? I have to admit my HGTV addiction may have inspired this latest home improvement! I’m so looking forward to cooking and baking in an updated kitchen. Woohoo! I managed to make these muffins before clearing out our kitchen in preparation for the mini reno. The muffins made the house smell just like a Bath and Body Works fall candle (which I am totally addicted to) but just knowing that we’d get to enjoy these muffins within the hour made the aroma that much sweeter. I certainly wish the house smelled like these muffins now instead of paint fumes! 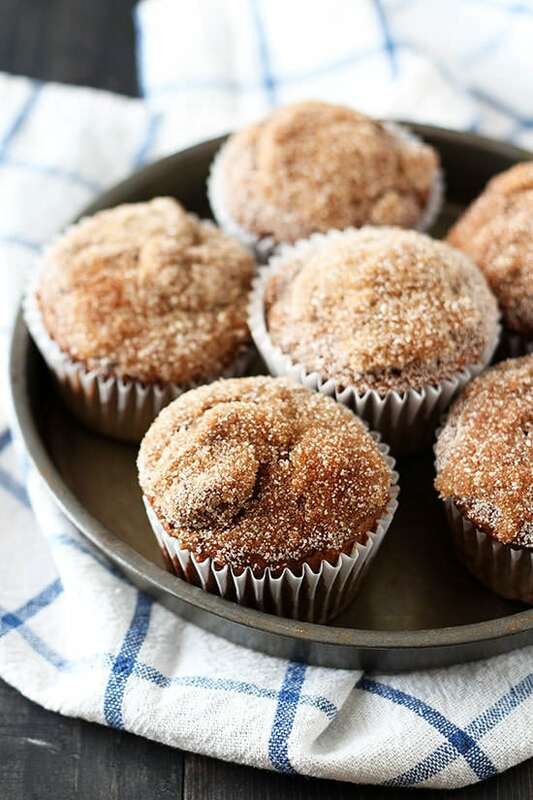 The best part about these muffins, which no one has to know, is that they’re made with whole wheat flour and no butter or oil! Sure they still have sugar but at least they’re a tad bit healthier. I used white whole wheat flour for a delicate wheat flavor and texture. 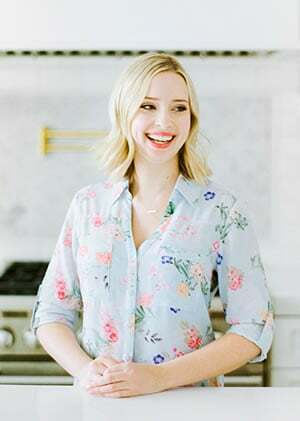 You can find white whole wheat flour at most grocery stores, but feel free to use half all-purpose, half regular whole-wheat if you don’t have it on hand. If you make these Pumpkin Cheesecake Snickerdoodle Muffins, be sure to take a picture and tag it #handletheheat on Instagram. I love seeing your photos! Use an electric mixer to beat the cream cheese and sugar until very well combined and smooth. Refrigerate while making the muffins so the cream cheese can firm. Preheat the oven to 400°F. Coat a standard two 12-cup muffin tin with cooking spray or 15 paper liners. In a medium bowl whisk together the flour, baking soda, salt, cinnamon, cloves, and nutmeg. In a large bowl whisk together the sugar, molasses, applesauce, and the eggs until well combined. Whisk in the pumpkin and vanilla until combined. Whisk in the flour and buttermilk in two alternating batches. Do not overmix. Fill each muffin cup with 1 to 2 tablespoons of batter, enough to cover the bottom. Dollop each cup with 1 heaping teaspoon of the cream cheese mixture. Fill each cup with the remaining batter, covering the cream cheese. Bake for 20 minutes. Let cool on a wire rack for 15 minutes before removing the muffins from the pan to cool completely. In a small bowl combine the cinnamon and sugar. Dip each muffin top in the melted butter then roll in the cinnamon sugar mixture. Hurray for kitchen updates! 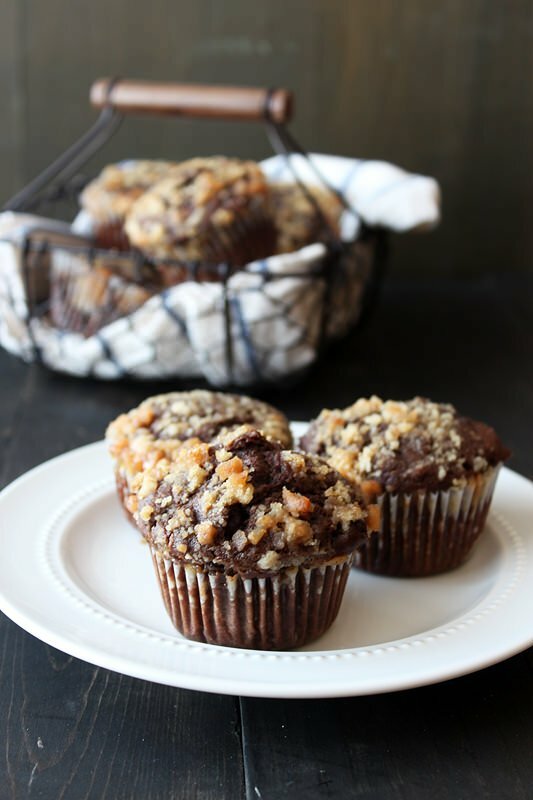 These are the perfect fall muffin, and so many good things tucked into one small package! Can’t wait to see the change in your cabinets! These muffins are definitely calling my name! Pumpkin, cheesecake, and snickerdoole in one recipe!?!? I think my taste buds just exploded! I love subbing white whole wheat flour when possible. It makes me feel like I’m eating healthy. Make sure to sit in a well ventilated area! New cabinets are exciting…inhaling fumes…not so much. Love these muffins with the little surprise on the inside! Good luck with the renovations. Congrats on the mini renovation and good luck with everything!! These muffins have got to be the most creative ones I’ve ever seen! And now these are all I want for breakfast 🙂 Such stunning photos (as always!) Pinned! I plan to make these with either all purpose flour. Will they come out as good? I made this earlier, it’s yummy I love the taste but the texture is chewy. Is it suppose to be chewy or I possibly overmix the batter ? Is there a substitute for the white whole qheat flour? I’m allergic to whole wheat.